· “Accommodation with discounted fishing” for 3, 4 or 7 days or longer. · 2018 Night Members can now book fishing up to the 6th month ahead. See https://www.manor-fisheries.co.uk/night-fishing/ for the 2018 Night Membership application form. · Bookings from the general Public requiring only Day Fishing (7.00 am to 7.00 pm) who can book up to the 3rd month ahead. To book Lake 2 (Carp/Catfish) anglers must indicate when they have fished here previously. · See https://www.manor-fisheries.co.uk/availability/ for both Apartment and fishing Availability. Not long now before we open again on the 24th March. General maintenance is almost complete while daily fish feeding has continued when possible. We can report that three Lake 1 (Carp) swims have been repaired this month and that three Lake 2 (Carp/Catfish) swims were upgraded last month. Do you find your plans unexpectedly need to be changed? Arriving home late on the Sunday 4th February the lake maintenance schedules for Monday and Tuesday had to be changed to include loppers and chain saw!! See above - Did you see Manor Fisheries mentioned by Duncan Charman on page 53 of Anglers Mail dated 27th February 2018? February is such an unpredictable month which earlier had sunny days, then wet days with high winds and ending with significant snow falls. The likelihood of imitating Winter Olympics “Curling” was zero and especially as the lakes were frozen and covered with snow. Not long now before we open again on the 24th March. General maintenance is almost complete while daily fish feeding continues when possible. We will keep you informed of progress while we look forward to receiving your comments, ideas and photos. In addition to recording Cats weighing over 30lbs, and please don’t be shy ……. we request anglers also record Carp over 20lbs as this forms the basis of our Monthly News Report and provides valuable input to our lake management plans. 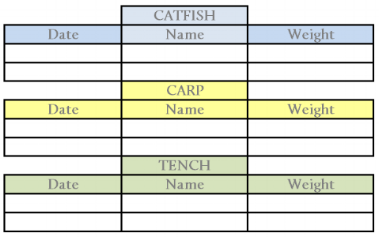 In the event these “Target weights” are not met, the above prizes will be awarded for the heaviest verified Carp, Catfish and Tench specimens recorded in the Cabin Log Book by or on Sunday 30th September 2018.